Our Premier Garden Shed is designed for maximum strength and manufactured from low maintenance ribbed steel sheeting. Check out Absco Premier Garden Shed if you are on the lookout for a top range garden shed. It is designed for maximum strength and manufactured from low maintenance ribbed steel sheeting. 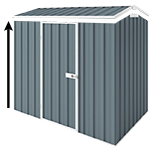 This 2.26m x 1.52m x 1.95m single door version is a perfect option for any size backyard.. A very popular shed as it comfortably fits into most suburban backyards and has a very attractive price tag. Packaging size and weight to help you organise your transport if you choose our popular FREE depot delivery option.